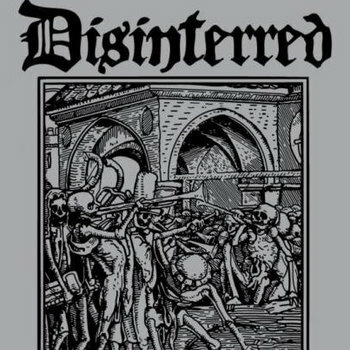 Raw and evil death metal to the least holy degree, Disinterred are here to rip off your face and toss into a pit filled with maggots. The crazed riffs and blasting drums are gloriously fun and their is a certain endearing insanity to the unholy vocal lines. The lyrics too have a certain raw satanism to them that makes the music almost fun, yet at the same time very serious. There are some very deep concepts addressed in this groups music and they definitely deserve consideration. They know how to defend their anti-Christian mindset and it provides for an interesting listen to say the least. Despite the demo quality the music is still fairly listenable for even casual death metal fans, while it certainly could be polished it is by no means a handicap and certainly gives the music a bit more of a raw edge. The production is not bad enough to hurt the dramatic intro of Once Bitten, the only part that really relies on solid production so as a whole the sound quality should be passable for most fans. The solos have a certain maniac Slayer touch to them and that helps to keep things very violent and fresh. In short, if you're looking for some purely violent and unforgiving death metal Disinterred is the band for you! Stream their demo on Bandcamp!